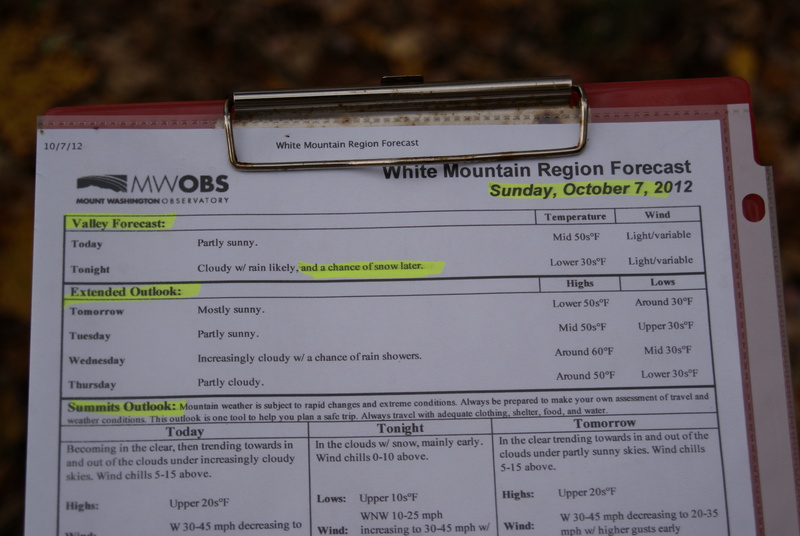 October in the White Mountains….brrrrrr! When I first started dating my husband, way back when we were innocent seventeen year old children, he introduced me to the joys of camping. The canvas tent, the leaky air mattresses, the sputtering inconsistent heat of the two burner table top stove. I didn’t necessarily love it, but I went along. 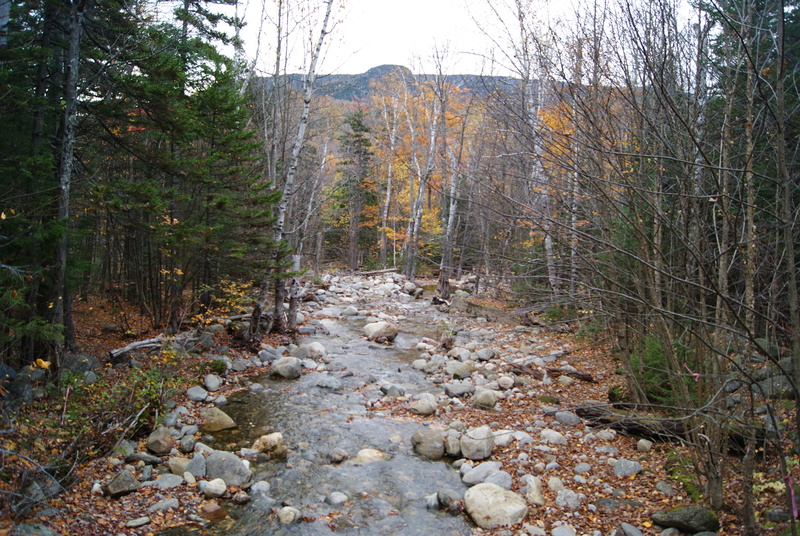 I wanted to impress this very cute boy, of course, but I also really did love the connection to the mountains and streams where we most often camped in New Hampshire’s White Mountain National Forest. Over the years, the tents have improved, changed to a camper and then come back to the world of nylon tents again. The stoves have improved, too, and I have mastered a long list of delicious meals that can be whipped up and served on that two burner stove. Our kids have grown up with camping, and they love it, unquestionably. It’s become a family ritual for us; the s’mores, the wood smoke, the bug bites, the charred shoes and singed fingers. When the kids were still kids, and we all lived here in this house, I was able to exert some control over the trips. I got to choose some new locations, to move us beyond the White Mountains. I was able to choose the dates and make sure that we were away long enough to justify the two week preparation period, but not so long that we started to smell/mildew/choke each other. And I absolutely held the line in terms of weather: I did NOT camp in the cold! No way. For me, camping was all about the sun, the summer, the starry warm nights. My few experiences with lying curled in a fetal position, shivering and trying to hold my head inside the sleeping bag while still breathing cured me of any desire to camp out in cold weather. We did go up to the mountains a few times in October, but we had a camper with a HEATER when we did. And I still complained. This year was sort of different. This year, my kids brought up the idea of camping out at our favorite spot near Mt. Washington for the Columbus Day weekend. They thought it would be fun to get us all together for a final salute to the summer of 2012. To my husband’s great surprise, I jumped at the idea. And I bet you know why. It had absolutely nothing to do with camping or the mountains or the end of summer. Nope. For me, it was all about having a chance to get my kids together for a few meals and some hours of family togetherness. Even when my middle child, Matt, had to back out of the trip for work commitments, I was still excited and enthusiastic. As it got closer, the weather report began to look more and more glum. Heavy rain, high winds, cold temperatures. From the warmth and safety of my nice house, I brushed aside any concerns. And off we went. And we had a great time being together, laughing, eating, enjoying the fresh air, feeling secure in our little rain fly. We had a great dinner and then stood by the fire, toasting the season’s last marshmallows. And then it was off to bed, under a sky filled with perfect silver stars. And the wind howled. I curled up like a caterpillar, holding the edge of my sleeping bag over my icy nose, wrapped in four layers of clothes and desperately trying to ignore the raging of the wind as it shook the tent and rattled the pots and pans on the picnic table. And then in the frosty light of dawn, Paul and I took a walk around the campground. We came to the site where the campground hosts were huddled in their giant RV, generator humming. We found a weather report, tacked to a tree stump. And I finally found the limit of my maternal love and devotion. I found the point beyond which I simply will not go. We read this sign, looked at each other, and went to wake up the kids. We were back at home, soaking in the hot tub, by dinner time. My idea of camping is staying at the Mt. Washington Hotel. I love all the camping accoutrements — sleeping bags, tents, hiking clothes and boots, basically the entire LL Bean catalog — but I don’t like actually using them in the woods after dark. But it sounds as if you’ll have good memories from this trip and tell fond stories of it, looking back and laughing at how cold you were. One of the best parts about camping is how much I love my house when I get back home! I don’t have to leave my house to imagine how miserable I would be in a tent around a campfire. I would not have been a happy Neanderthal. I survived two weeks of Girl Scout camp when I was ten. I still remember the outhouse. Oh, the frozen bottoms stories we could tell as Girl Scout survivors…I mean “participants”.! And I looked so awful in the green uniform. But I loved (and still do) the mint cookies. I hate camping but I can see why you looked forward to this one trip – and it didn’t sound that awful. I prefer camping in the cold because there are fewer bugs and less sweating. Bravo you for doing this and what a wonderful memory you’ll always have! Good point about the bugs; I never thought of that! We did have a good time, but I have to be honest: I liked the “hot tub” camping that we did at home the best! You are a good sport! A chance of snow would have sent me back to a warm house to enjoy the hot chocolate, the oatmeal, the cider and the red wine….. in front of the fireplace. Luckily, my kids are getting less hearty with age, too! They were pretty happy to be home! Oh, me, too! And when there is 0% chance of precipitation! My idea of camping is being more than 50 feet away from indoor plumbing or an English muffin, whichever comes first. Oh, I know what you mean!! I’m shivering just reading about it! I would have done the same thing. Well, ok, we both know I wouldn’t have gone in the first place! But I’d have saved a spot for you at happy hour at the Mt. Washington! Hahaha! Now THAT sounds like a good plan! Next summer? Can’t blame you at all! I love camping but snow is where I draw the line. Well, I might even draw the line at cold and rainy…. I am hoping that my family has made a new commitment to “hot tub camping” at our from now on! As a scouting mom, I didn’t mind the camping so much. Not even snow camping, but I’ve discovered as I get older. I’m pretty happy when I don’t have to sleep on rocks and dirt. Call me “Cinderella.” but…aw heck…I don’t care what you call me. I can make s’mores at home. I’m with you! S’mores taste even more delectable when I’m huddled on the couch with my jammies on!